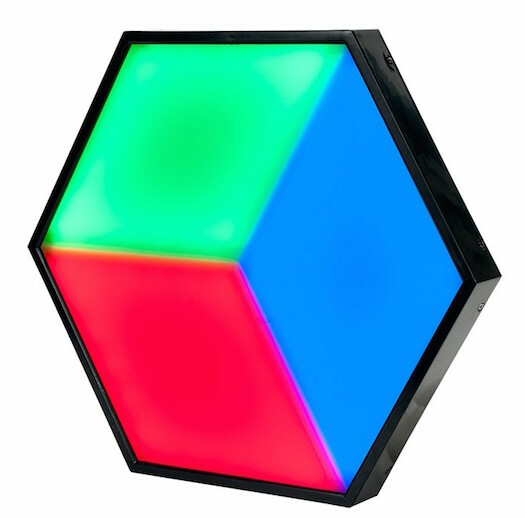 The 3D Vision Plus is a hexagonal shaped LED panel with stunning 3D visual effects when used in multiples. Designed for nightclubs, lounges, bars, entertainment centers, stages and mobile entertainers. The 3D Vision Plus has a 4-Button menu system with a digital display. It may be controllable via DMX using a DMX to RJ45 adapter. It can also be used with EZ Kling interface for Artnet and KlingNet, LED Master control. 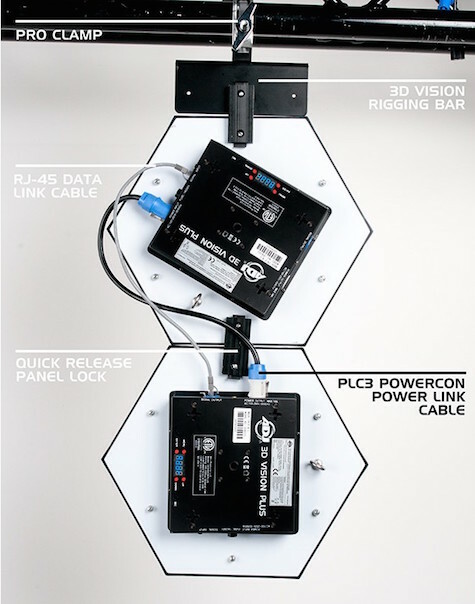 Link multiple panels together via powerCon input/output with RJ45 ports for data linking. Panels lock together with an easy to use quick release panel lock. Rigging bars are also available for dead hang installation (M10 thread on the rear for a Pro Clamp so units can easily be fastened to truss or 2-inch pipe). Measuring 15.8” x 15.8” (400mm x 400mm), the face of each 3D Vision Plus panel is covered with a frosted white acrylic panel which diffuses the light from the 72 3-in-1 RGB LEDs beneath. This creates an even spread of light within each of the three sections and gives the 3D vision a wide 180-degree viewing angle. • Distinctive hexagonal-shaped LED panel is divided into three separate sections in a way that gives it a unique three-dimensional appearance. • Weight: 6 lbs./ 2.74Kgs.